A child’s first days of school are a memorable event for both students and their families. The child enters a new experience, eager to learn, make new friends, and lay the foundation for the child’s next 13 years. In Kentucky, all children entering kindergarten for the first time should be ready to engage in and benefit from early learning experiences. As defined by the Kentucky Governor’s Office of Early Childhood, this is the purpose of School Readiness – to have students “ready to grow, ready to learn, and ready to succeed”. Logan County Schools is pleased to announce the development of the Little Cougar Academy (LCA) for the incoming 2016-2017 kindergarten students. Any child entering a Logan County kindergarten class during the fall of 2016 may enroll in the Academy during early kindergarten registration scheduled for January 12 and 13, 2016. The free Academy is designed as a collaborative partnership between the school and parents and will meet at the Logan County Public Library from February through May. During the monthly Academy meetings, incoming enrollees and their parents will take part in activities designed to promote learning experiences in three areas: math, literacy, and health and physical well-being. Beginning in February, families will meet and take part in a “make and take” activity, where the parent and child create their own learning game. Then children are invited to story time and library activities, while parents meet with different professionals to help teach parents to become “teachers” for their children. 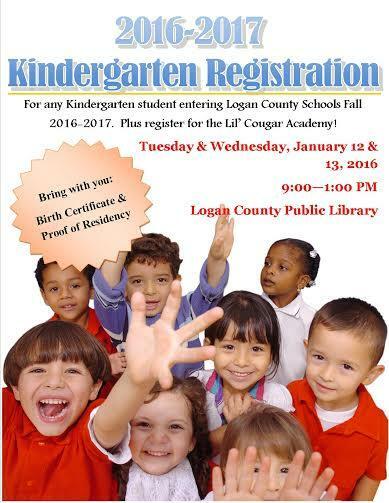 Logan County Schools will have Early Kindergarten Registration at the Logan County Public Library on January 12 and 13, from 9 a.m. to 1 p.m. Parents are asked to bring a copy of the child’s birth certificate and proof of residency (e.g., utility bill, account statement, etc.). This registration is for any child entering kindergarten during the 2016-2017 school year. Additionally, during this time, families may register for the Little Cougar Academy. For further information regarding registration or the Little Cougar Academy, please contact Dr. Goley at 270-726-2436.